Guests ride along in snazzy "clamobiles" with the plucky clownfish from Finding Nemo and his pals as they romp in their computer-animated undersea world. Remarkably, the animated creatures meld with the real creatures in the Epcot pavilion's saltwater tank during the attraction's finale. It's a clever use of the charming Finding Nemo characters and a cute, winning ride. Some scenes are dark. The sharks can be a tad frightening. And there's a decent dark ride gotcha when an anglerfish pops up. 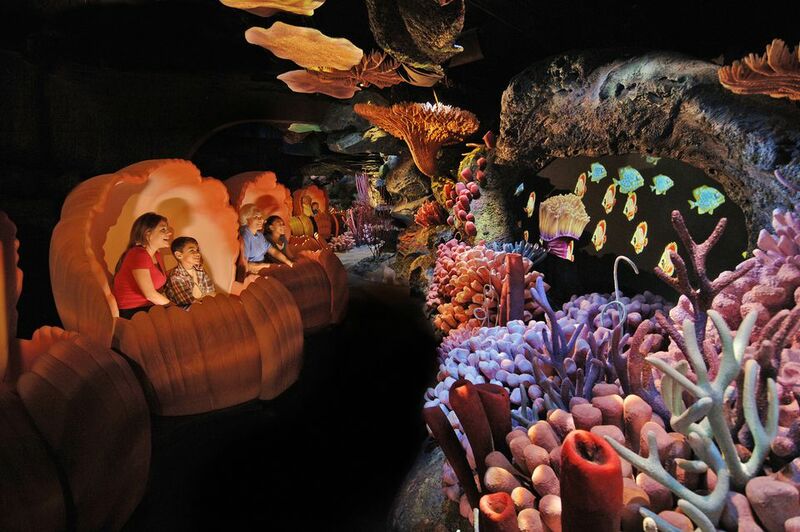 Both the ride and the entire marine life pavilion are called "The Sea with Nemo and Friends." Guests can access the pavilion's other attractions, including the 5.7-million-gallon saltwater tank that is its centerpiece and the wonderful Turtle Talk with Crush show, after disembarking from the ride. Learn how to make The Seas with Nemo and Friends ride reservations with Disney World's My Disney Experience. Instead of the tug-at-your-heartstrings storyline that drove the hit Disney-Pixar film, the tone of The Seas with Nemo and Friends is appropriately light and playful. Jokester Nemo, it seems, pulls a fast one on his friends and doting dad, Marlin, by swimming away from his school group and causing an APB for the missing fish. (You'd think the mischievous lad would have learned his lesson; don't they read "The Boy Who Cried Wolf" in Mr. Ray's class?) With everyone on a mission to once again find Nemo, riders can see the giggling clownfish lurking behind coral and hiding just out of sight from his search team. A particularly enchanting scene reunites Nemo with surfer-dude Crush the Turtle and his son Squirt as they navigate the East Australian current. By using large screens and placing the vehicles close to the computer-generated action, disoriented riders feel nearly enveloped and swept away by the current. Further blurring the line between virtual and reality, the Disney Imagineers developed a way to project the animated characters onto the glass of the pavilion's existing aquarium. During the ride's final act, Nemo and his buddies actually appear to be swimming alongside the tank's genuine fish. While there isn't any 3D technology employed, when juxtaposed against real creatures in a three-dimensional environment, the computer-generated characters assume a stunning 3D-like quality. The Seas with Nemo and Friends added a much-needed does of levity and relevance to the former Epcot exhibit, which had been lacking both. "Pavilions need refreshing from time to time," says Kathy Mangum, Disney Imagineering executive producer and vice president. And how. Through the years, regional aquariums had eclipsed The Living Seas, as the tired pavilion was originally called. Disney even closed the uninspired ride that had once been one of its features. Instead of the haphazard, claustrophobic entry hall that used to welcome guests to The Living Seas, a delightful queue leads guests along a boardwalk to a beach. And instead of the silly "hydrolators" that used to take visitors to the ocean floor, guests now slowly meander into the pavilion and find themselves somehow transported to a fantastic underwater world. There, bright orange "clamobiles" beckon to take them on their journey with Nemo. This is the kind of timeless, immersive storytelling for which Disney parks are legendary. If you love The Seas with Nemo and Friends, check out the other Best Walt Disney World Rides for Kids.